Visual Astronomy: What a Birthday Gift! Tonight's (Mar. 12) viewing conditions so far have made for a great birthday gift! Seeing is very steady, with patchy high clouds. The seeing is the best I've seen yet, as a matter of fact! (Seeing is a rating of how steady the air is) Views of Saturn and the Moon are incredible! 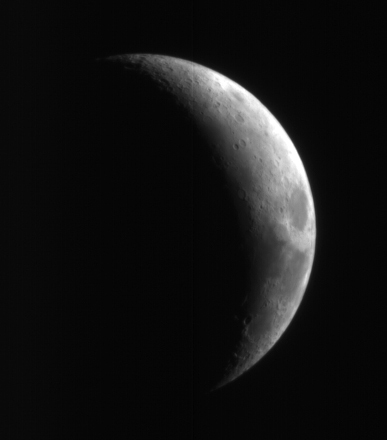 I first set my telescope up outside to cool down. Its been pretty cold at night here, so I wanted to give it plenty of time to cool. Once I went back out to observe, I first thought that the night would be a wash because of scattered high clouds. A view through the eyepiece quickly changed this assumption, however. My first target was Luna. I started off with my 6 mm eyepiece, yielding 208x magnification. On an average night, this would be bordering on unusable, due to typically poor seeing in my area. After viewing through this eyepiece for a while, I realized that the views were much sharper than normal. So I decided to throw in my 4 mm eyepiece, which almost never gets used due to its 312x magnification. This is almost always too much for my local atmosphere to support. To my surprise, however, the image was tack-sharp at 312x! Detail at the terminator was amazing. The craters appeared to pop out in 3-D! I was so astonished at the views at this magnification, that I didn't realize the moon was about to go behind a cloud until it fuzzed out completely! After the moon went behind a cloud, I saw that Saturn had popped out from behind another cloud. Instantly, I turned my scope around and targeted the planet with my finderscope. My first views of Saturn at over 300x were astounding. There is so much to see there, including the cloud bands, the Cassini Division, Saturn's moons, and the shadow of the rings on the planet. All of these features were obvious in the eyepiece. There was no straining to see the Cassini Division, it was just there. The planet didn't wiggle or waver, just tack-sharp! It almost looked like a text-book image of Saturn! Eventually, clouds moved in over the entire sky. As I'm writing this, I'm waiting for the clouds to move out again, hoping the seeing will be just as steady. Conditions like these are ones to remember. Sorry for the sparse writing this week, its spring break time! Nice post. great ideas about birthday gifts. Gaining a clear and complete view of information that matters to your business often requires both a high-level perspective and detailed data. With just a few clicks, Visio 2010 Download helps you see the entire picture by showing meaningful data and information graphically in a single, up-to-date diagram. Project 2010 Download is compatible with previous versions of Microsoft Project. Bless you for the caution of these tank top, this can be thats a I would like. Considering that the stop of your 12 already or maybe I actually do do not own to be able to manner huge amounts of money of the data instantaneously, an important web page Internet marketing also digit. Needed assert separate the style from the position for your wonderful convey upon commenting. This approach content brings the wonderful info in connection with researching about a very problematic lawsuit. Investigators exploiting a lot of incorporated usual tactic to earn understanding account. At this time follow-up check cashing Pretty decent Do the job!